Photo= Popular characters, including (from left) "C-3PO," "Kylo Ren," appear at the prayer for Star Wars' success. The folding screen presented that day is in the background= September 12, Museum Hoshokan, Byodo-in Temple, Uji, Uji City, Kyoto Prefecture. A prayer that the movie, "Star Wars: The Last Jedi" will be a hit was held on the morning of September 12, at Byodo-in Temple, a world heritage site in Uji, Uji City, Kyoto Prefecture. A folding screen of the movie characters produced by Masayuki Kojo, an artist of "Bujinga," or warrior painting, from the same city, was presented, and a "Kyogen," or a traditional Japanese comedy, which incorporated elements of the movie was performed. 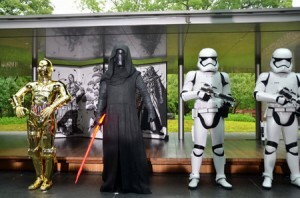 Moreover, popular characters from the movie appeared, livening up the event. The movie is the latest episode of the worldwide popular series and will be released on December 15. The prayer for its success was planned in order to promote the attractions of the series, which is said to have been partially influenced by Japanese culture. The folding screen is about 1.7 meters high and about 3.3 meters wide. Popular characters "C-3PO," "R2-D2," and "Kylo Ren" are depicted vividly with strong ink strokes. Kojo said, "People's determinations are rendered in this work. I hope each person interprets the painting in their own way." The "Star Wars Kyogen" play performed by Senzaburo Shigeyama, an Okura School Kyogen actor, and others, is based on a classical Kyogen play titled, "Fumi-ninai." Compared with normal Kyogen plays, this performance was unique as actors' voices were transformed into those of the movie characters, such as C-3PO, using voice changers. Rian Johnson, the movie director, said, "The Star Wars style is very close to Japanese culture and aesthetics." Keiji Yamada, governor of Kyoto Prefecture and others, also visited the event. The event was concluded with a prayer ceremony conducted by Monsho Kamii, the chief priest at the temple. The folding screen is on exhibit at the nearby Uji City Tourist Information Center from September 13 to October 1.